Over time your sunset oil paintings will become soiled from dust, lint, cobwebs, dirt, cigarette smoke, or just plain old wear and tear. This can cause all the beautiful colors of the sunset to appear dull and less vivid. With some simple cleaning techniques it is easy to keep the dazzle in those brilliant shades of yellow, orange, blue and purple that make up your sunset canvas art. The first thing you need to do is remove your painting from the wall. Never try to clean it while it is hanging. You should also remove it from the frame as well. Dust does get into the crevice where the frame overlaps the painting sometimes it is impossible to clean it out while still in the frame. When cleaning be sure to use a soft cloth. Old cotton t shirts or even cloth diapers are great for this purpose. For dusting you can use a feather duster or a Swiffer Duster to remove light coatings of dust, cobwebs and lint. For grimy, oily or sticky areas of the painting you can use an emulsion cleaner that can purchased at an art supply store. Never use a strong detergent as this can damage the colors of your sunset painting. Preserving your sunset oil paintings so they will last a lifetime and even into the next century is a simple task if you follow this easy commonsense technique to care for your artwork. Do not expose your painting to direct sunlight or ultraviolet lights over an extended period of time. Doing so will result in the bright yellow, orange, blue and purple pigments that make up your sunset to fade over time. The best lighting is diffused natural or artificial lights. Oil paintings need to have some exposure to diffused lighting, if left in storage or in an unlit room for extended periods of time, the linseed oil in the pigment will turn yellow. However, this is a naturally occurring event that the oil goes through. The yellowing can be reversed by putting the painting in a room with natural or artificial lighting. After a couple of days the yellowing in the linseed oil will fade and restore the painting to its original color. Atmospheric conditions can also affect oil paintings. If you want to make sure your sunset painting will last a hundred years and beyond then you need to take certain steps to protect your canvas art from damage by the environment. Every part of a painting will expand and constrict due to atmospheric conditions. This will cause stress on the painting which can result in premature aging and damage to the artwork. Undergoing rapid changes in temperature and humidity will create the most stress on a work of art. The best environment for a sunset painting is a controlled one where there is a constant 65° temperature. If this isn’t always possible, the next best thing is to take these precautions. It is best to avoid conditions of extreme dryness and heat or humidity and cold that can occur if the painting is displayed in areas where they are directly under air conditioners, heating vents, fireplaces, etc. Also kitchens and bathrooms can create conditions of rapidly changing heat, cold and humidity. Long term exposure to such conditions can cause the paint to flake, the canvas to rot, or the pigment to discolor. A setting sun is loved most for its warmth, charm and most of all its vibrant colors. Just about everyone loves the view a sun creates while rising or setting in the sky. What a wonderful way for the Creator of all the universe to say “Good morning!” or at the end of a working day to see Him say, “Good evening.” There’s just something about rays of sunlight bouncing off the clouds creating all those vibrant colors that appeal to us. Is there any wonder why artists from all over the world love to capture the setting sun in all its grandeur and splendor and to forever immortalize a fleeting moment like that in one of their oil paintings? The sun sets quickly and lasts for only a few minutes but the beauty of one can last for a long time when an artist takes it and creates a wonderful work of art on canvas. The world over artists have captured the setting sun in all its splendor in their paintings of sunset. The colors they use are brilliant yellows, oranges, blues and purples in the sky and along with dark shadows of dark browns, deep blues and rich blacks. Yellows and oranges are warm colors which make up the majority of the sinking suns rays. Blues and purples are cool colors that balance out the warmth. On the ground, the warm browns added with black give the warmth of the earth, while the blues added to the black in the shadows give us that impression of cool. And don’t forget the setting sky is always reflected in any body of water. There is nothing that can substitute for quality wall art in your home, especially when it comes to sunsets on canvas. Oil paintings hanging on the walls in your home or place of business create a welcoming atmosphere for visitors and family members as they view them. Sunset paintings give warmth and charm to a room like no other work of art can. The vibrant colors instantly capture of the eye of anyone who happens to walk by. 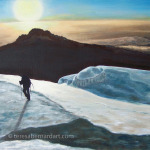 Sunset oil paintings also make wonderful gifts for a housewarming or grand opening for a business. Not only on those occasions, but for the holidays, birthdays and anniversaries too. Next time you need a great gift idea consider a sunset oil painting rather than a boring ol’ house plant. 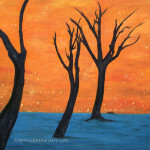 If you are a collector of fine art, sunset paintings make great additions to your collection. Some famous artists like Claude Monet and Thomas Kinkade, to name a few, have painted some well known paintings of sunsets. Or if you prefer, up-and-coming new artists who are not as well-known also provide great works of sunset art to enjoy. There is simply something for everyone when it comes to enjoying beautiful artworks of the setting sun. 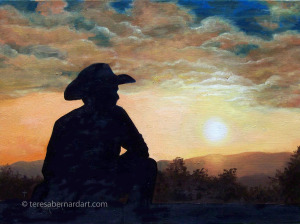 One of the most beautiful places in the world to capture a sunset in oil on canvas is Texas. Being a native Texan, of course I’m prejudice! 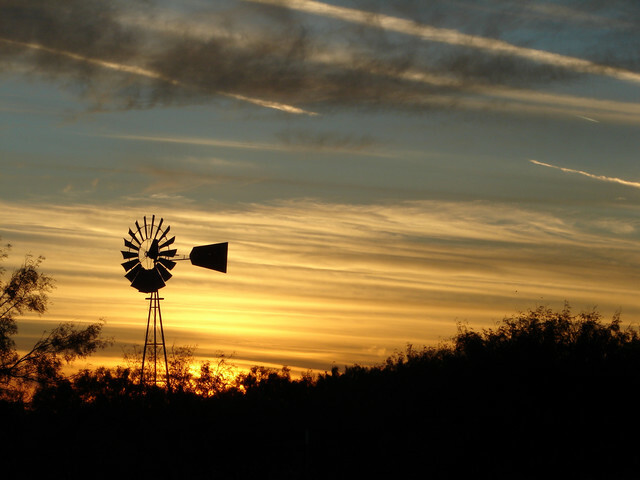 The Lone Star State with its wide open prairies, cacti, ghost towns, old west culture and billowy clouds make a wonderful backdrop for some of the most breathtaking sunsets anywhere in the world. Artists, like me, who are fortunate enough to live here get to regularly enjoy countless opportunities to capture on canvas the setting sun in all its grandeur and splendor for our many sunset paintings. Those who don’t live here can delight in making trips to Texas to see the setting sun for themselves and take it back to their studios in the form of digital photos for many future paintings to come. Texas cities can make a great sunset cityscape with the unique sky line each metropolis has to offer. Head to the Gulf of Mexico and artists can experience the sun going down on the beach or head out west for a more mountainous terrain and get a glimpse of the mountain peaks of Big Bend National Park as they silhouette them against an orange glowing sky. A beautiful sunset helps the viewer to appreciate the finer gifts life has to offer. People are naturally drawn to a sunset and there are a few special places on earth where one can embrace a beautiful sunset. Texas just happens to be one of them. A beautiful sunset helps to inspire you. There’s a reason sunsets are timeless and constant standbys of poets, writers, romantics, and artists — they are inspiring. There is something inherently powerful and spiritual about sunsets. 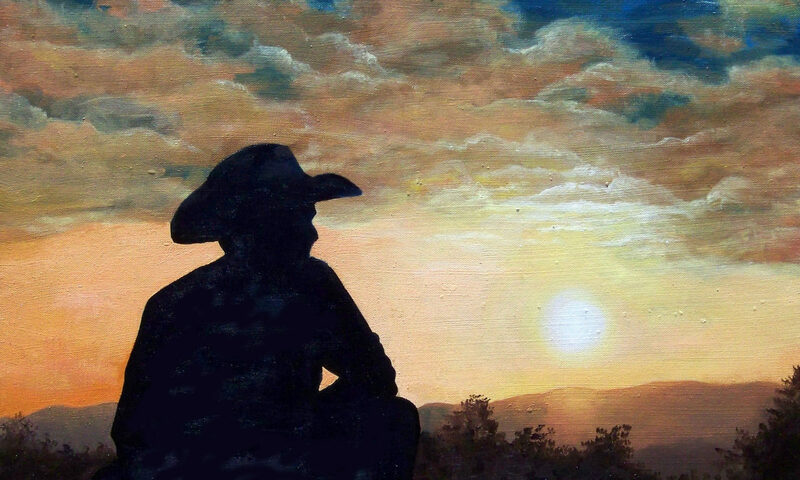 Capturing the beauty of a sunset in oils is a popular genre of art for many artists. 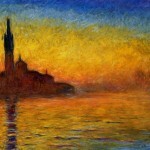 At one time or another most fine artists will choose to create one or sunset oil paintings. There’s just something about capturing the sun at its most beautiful moment of the day, right as the sun is going down. It’s a breathtaking phenomenon when the sun turns in for the night and twilight sets in, the moment when the sun’s rays radiate outward across the sky and horizon giving off vibrant shades of reds, yellows, purples and blues. Below are some helpful tips to creating stunning sunset oil paintings. When you use the following tips to create your sunset art, you will have more success in your paintings. Note: These tips can also apply to a sunrise painting. Keep in mind that no two sunsets are ever exactly alike. There are always differences in cloud formations and light effects. Oils are the best medium for painting a beautiful sunset painting because they blend seamlessly and easily. As you paint your sunset, think of a flashlight as being behind the clouds and wherever there is an opening a beam of light will shine through. The rays of sunlight should be painted like a railroad track or road going off in the distance by the use of perspective. This is achieved by using a vanishing point. When creating your composition, try to choose unusual angles to include in your painting. And remember, because your painting will be back-lit, the water and rocks will have cast shadows. Most sunsets use a variety of shades of orange, yellow, blues and purples, along with sienna and black. Keep your palette with as few colors as you can. Limited palettes are less confusing. Choosing only five to seven colors makes it easier to remember what colors you mixed for a specific part of the painting. Your color should be most pure and vibrant close up and then is toned down as it reaches the horizon. This creates depth in the painting. As you are painting a sunset it is important to keep cleaning your brush, this helps to stop your work becoming muddy. When painting a sunset on the water, the colors present in the sky will be reflected in the water. The sun should always be painted with pure, brilliant color and then adding darker colors to surround it. Lay in your colors in a circular manner and blend them together. Start your painting by blocking in large masses of colors, keeping your values simple. Continue until you have a composition that is to your satisfaction. Next, create the illusion depth in your work by including more detail in the foreground and diminishing detail as the distance increases. Paint with boldness and do not be overly concerned about adding any detail until your painting is almost finished. Using these few tips will help you get the most from your painting session. Just about everyone loves a beautiful sunset. That radiant burst of color at the beginning (sunrise) or end of the day. 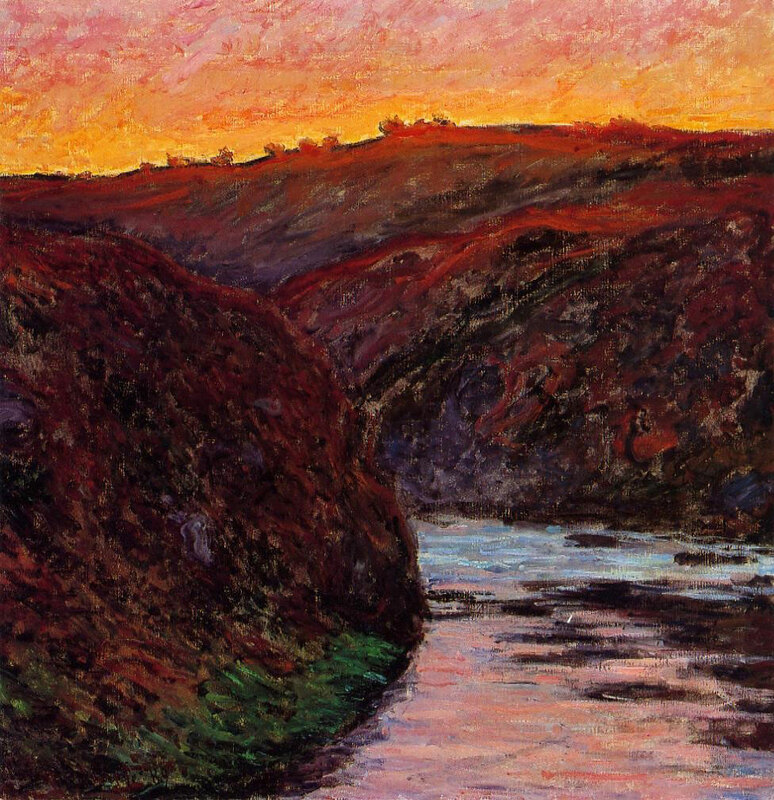 Because of this, sunset paintings are a favorite subject to paint for many artists. However, painting a sunset on location isn’t practical. Therefore I suggest taking your camera and shooting reference photos of some lovely sunsets to use back in your art studio. Using reference photos to create your oil painting is a handy method that will save you time and also preserve your sunset in real life. No two sunsets are alike and they disappear quickly, therefore, taking a reference photo of your sunset can prove to be very useful. 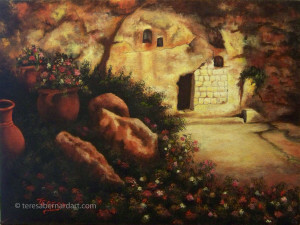 It allows you to paint your painting in the comfort of your art studio and at any time of the day or night. The sun sets quickly in the evening sky. It would be hard to get your painting done before it goes down. No two sunsets are identical making it further difficult to paint one on location. Painting a canvas on location would require it to be started and completed in the same session, however since the sun goes down so fast, this might not be possible. Photographing the sunset means you can now take it with you back to the art studio and use the image as reference material for your painting. Tip 1 — Show up early for the shot. It may seem like a slow setting sun, but in reality a beautiful sunset is over with very quickly. Arriving early allows you the opportunity of getting several detail shots for shadows and also other objects that can be used to make your sunset painting a more interesting composition. Try to include objects other than the sun or clouds in your photo shoot. Also think about silhouetting some of the objects against the sky. You will also want to take some photos after the sun has already gone down for further reference when you go back to you studio to start your painting. Tip 2 — Apply the rule of thirds when photographing the setting sun. Place the horizon either 2/3 of the way up or down in your shot for a more interesting composition. It all depends on your emphasis. If you have a dramatic sky then place the horizon line low to include more sky than ground, if the ground or water is more dynamic than the sky, then place the horizon high on your canvas to include more of what’s going on below. In addition, do not place the sun directly in the center of your frame.  Place it over to the side to create more interest. Be sure to use these same tips when you transfer your composition to canvas. 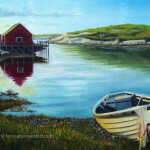 For more information about the rule of thirds, see article titled “Creating Better Compositions in All Your Paintings“. Tip 3 — Determine what orientation, either portrait or landscape, that you want to your painting to be. Most sunset paintings are landscape in orientation because this allows for the widest possible angle to capture on canvas the most sunset. However don’t dismiss a portrait orientation especially if you have something interesting going on in the foreground. 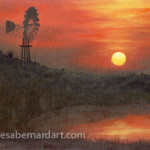 Vertical sunset paintings offer much when it come to including other objects such as water towers, windmills or trees as silhouettes in your painting. Consider including some of those objects too. Following these simple tips will help make it easier to compose your painting once you get back to the studio and start putting brush to canvas. Sunsets are a favorite genre of Teresa Bernard. You can view her sunset oil paintings here. 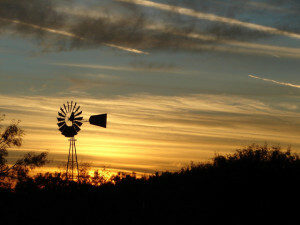 Texas is known for its many beautiful sunsets in the evening sky. Growing up in Texas, I had opportunity of a lifetime of observing many beautiful skies filled with a wide array of shades of orange, yellow, purples and blues. Is it any wonder that I would choose to create sunset oil paintings as part of my repertoire of art? Sunsets are certainly a favorite genre of oil painting for me because of the many bright colors. I also appreciate the fact that the sky at sunset (or sunrise) can be incorporated into many different settings of landscapes, seascapes, and even skyscapes. Sunset paintings are a picturesque representation of the evening sky and sun in all its grandeur and splendor. Just the way God intended. Artists worldwide love to paint sunsets because it gives them opportunities to include vibrant shades of yellow, orange, blue and purple, along with earth colors of dark browns and rich blacks which work together to create warmth and charm within the wall art. The rays of light that bounce off and peek through the clouds create excitement and drama like no other. They catch the eye of the viewer drawing him/her in. Sunsets are for romantics and many artists of oil paintings have captured the romance of a setting sun in some of the most exotic places in the world. Sunset paintings in these settings allow the viewer to be whisked away in their imaginations to some faraway places. 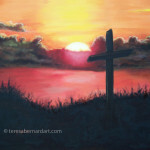 Sunset paintings look great in just about any room of your home, office, or place of business. Click to see more of my sunset paintings in “Paintings of Sunsets Collection“. 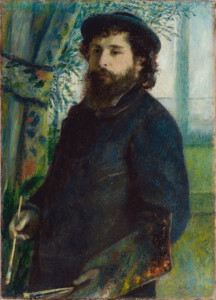 Oscar-Claude Monet (14 November 1840 – 5 December 1926) was a French Impressionist artist who lived around the turn of the 20th century. 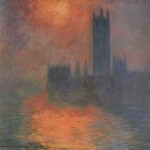 He is best known for his water lily paintings, as well as, for many other oil paintings including sunsets. In his paintings Monet loved to paint the same location during the different seasons of the year and various times of the day to experiment how light shown across the sky and other objects within his paintings. His sunset paintings are most noted for their bold use of reds, yellows, oranges, blues and purples that make up his complex and lively sky scenery. Obviously sceneries of sunsets and sunrises were perfect opportunities to introduce vibrant color balances to tried and tested locations giving them a new fresh look. 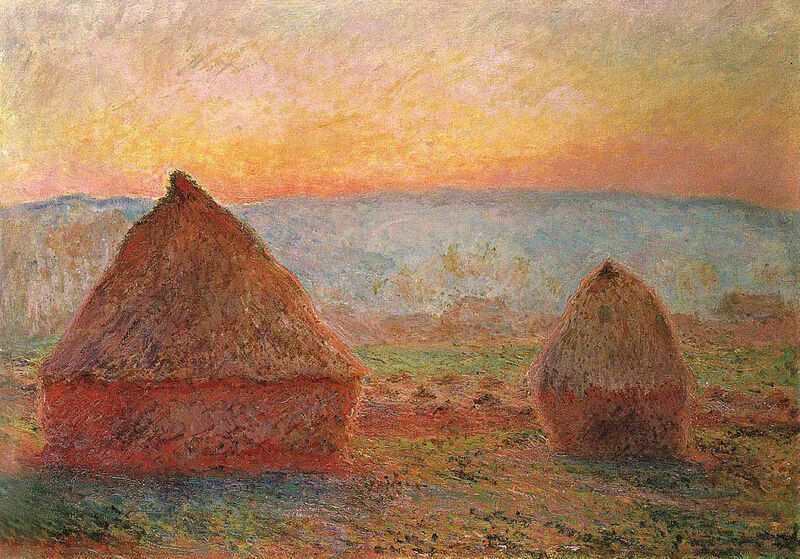 In 1890 and 1891, Monet painted a group of pictures of the stacks of wheat (referred to as grainstacks or haystacks) in the fields near his home. 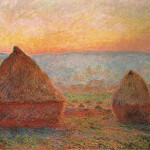 This sunset painting is part of the Haystack series and one of the three grainstack paintings. The grainstacks represented the prosperity of the village near where he lived. 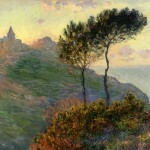 The view in this painting is across a gorge to the cliff-top church at Varengeville. 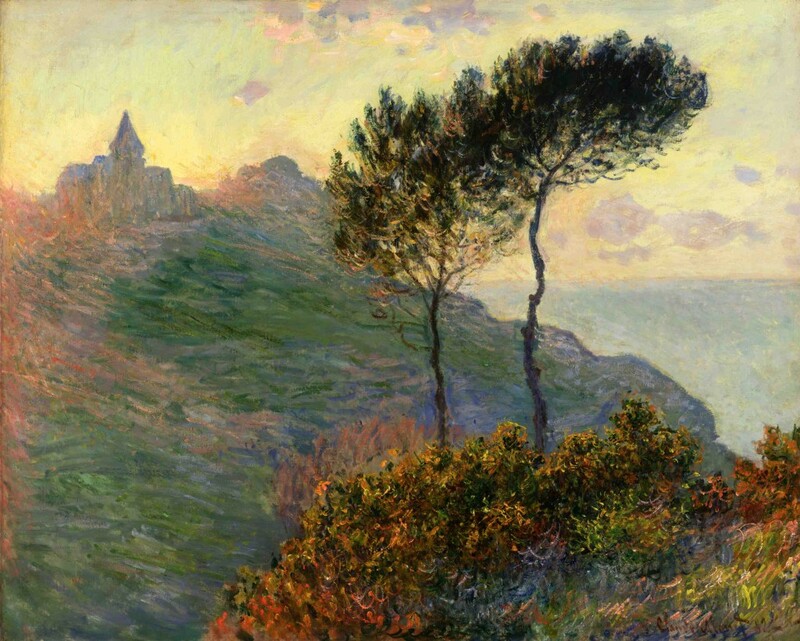 This sunset view of Varengeville is from a series of four painted by Monet. The light from behind the church dissolves its form and catches the foliage in the foreground. Monet spent all of the spring of 1889 in Fresselines, a village along the Creuse river, exploring this world through his artist’s eyes. Between March and May, he painted a series of nine canvases inspired by this landscape, which he described as “a place of terrific and savage beauty”. 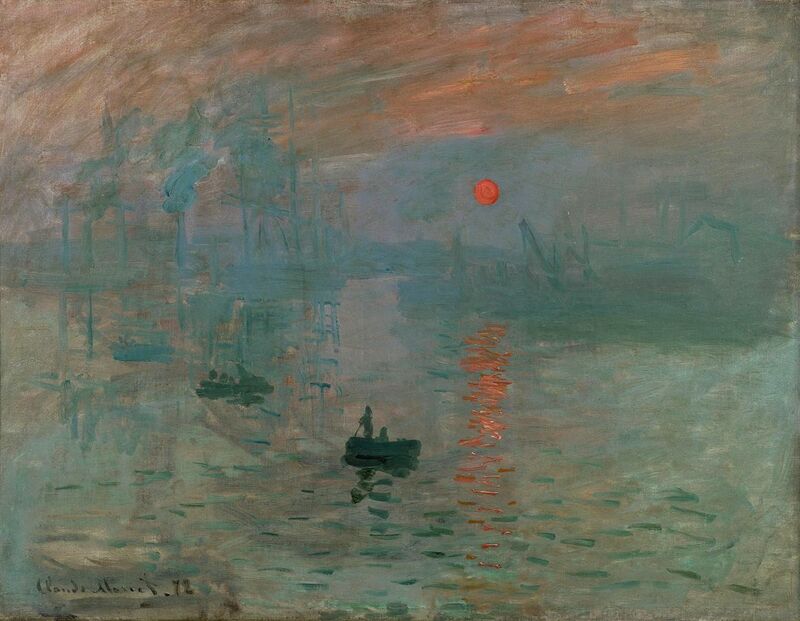 This painting depicts the port of Le Havre at sunrise, the two small rowboats in the foreground and the red sun being the focal elements. 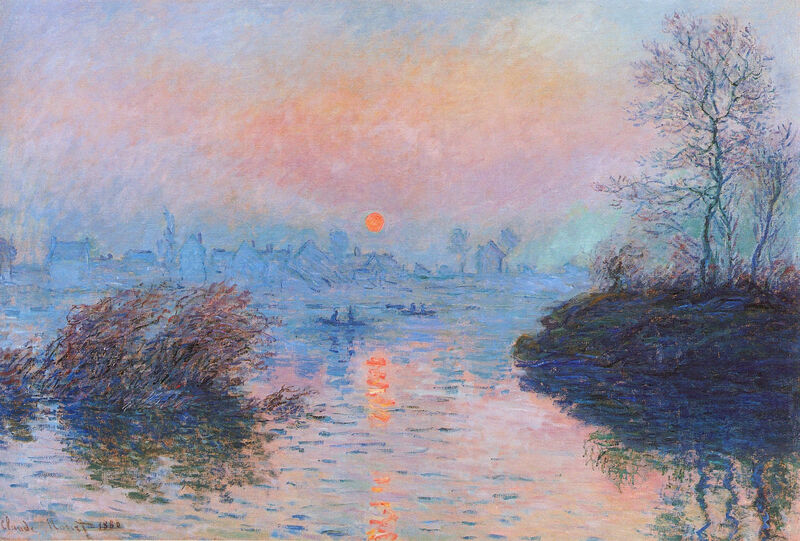 Impression Sunrise is generally acknowledged as one of Monet’s most influential of his paintings. 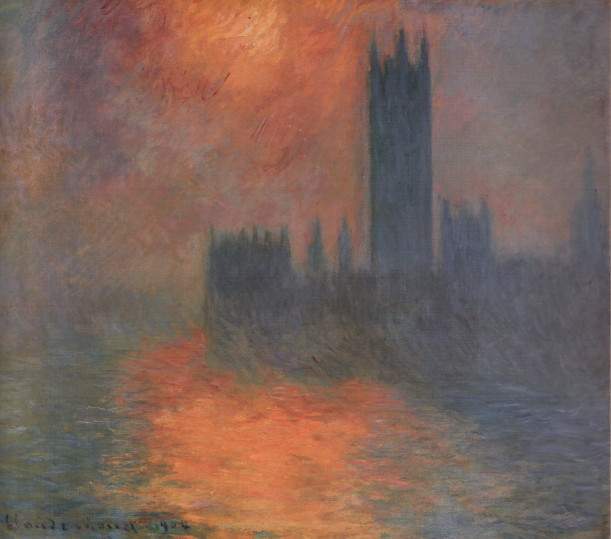 One of the 19 known paintings by Monet in the Houses of Parliament series. This painting represents a pallet of purples, reds and yellows to create an inspiring skyline. 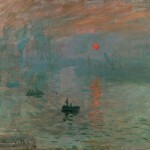 A feature present in many sunset paintings painted by Claude Monet. 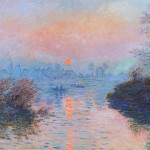 This work is the most reproduced of all Monet’s paintings. The reason for this is obvious when one observes the splash of color across the sky and reflected in the water below. It is highly artistic and features the beautiful city of Venice Italy. This sunset painting is a stylish and charming one because of its colors and contrasts. It includes a nice blend from sea to sky with a red sun which captures your attention. The landscape is featured with neutral green colors and blue tones which makes the entire work hold together quite nicely. Artist Claude Monet is considered one of the greatest oil painters of all time. 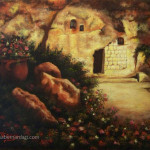 His paintings are highly favored and sought after by art collectors world wide. 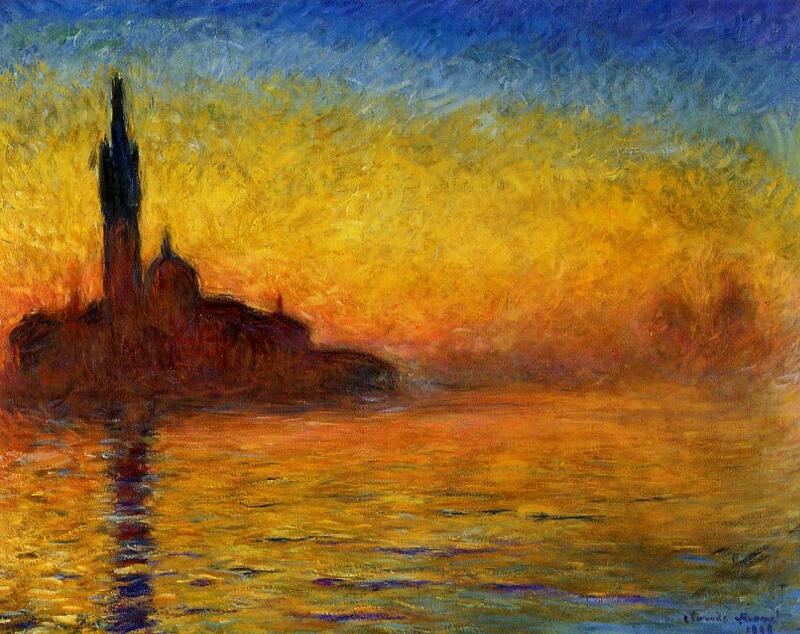 Claude Monet sunset paintings can be viewed at art galleries around the world. 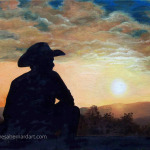 If you enjoyed these fine sunsets, you will want to check out more fine art paintings of this genre. 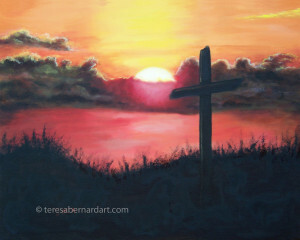 See Paintings of Sunsets Collection by artist Teresa Bernard.